No matter how you cut it, we’re having a short growing season. Rotations that looked good last autumn, when the first seed and fertilizer were purchased, don’t look so hot today. Most people agree that farmers cannot expect a normal cash flow in 2018. Unless the star alignment changes quickly, many growers who are highly leveraged will be lucky to cover interest. Profit may be out of the picture, says Gene Breker of Amity Technology in Fargo, North Dakota. “It’s pretty well-accepted that farmers only make money when they have an exceptionally good crop,” says Breker in an interview from his farm in the southeastern corner of the state. A year like this requires a different mindset, according to Ken Greer of Western Ag in Saskatoon. He urges farmers to look at what they can grow on their land, not at commodity prices. Greer says canola acres will take a hit. Price doesn’t matter if the crop can’t come to fruition in a compressed summer. As of publication date, many canola areas that are normally seeded by now still have frost in the ground. Standing pond water tells us the soil below is still frozen. “Growers are backing off on canola because of the inability to get it in on time. With the required growing season length for canola, you may not be able to get a yield,” says Greer. He adds that old Polish varieties were once a reliable standby in difficult years, but lower yields keep them out of most farm recipes. “Nearly all the yield potential we’ve gained in canola is because of heat-resistance and long growing seasons. We don’t have those conditions this year. We’re almost at the end of April and there’s no canola in the ground yet. Nobody’s heard of that before. But a lot of guys will seed it anyway. They’ve already bought the seed and they’re gambling that maybe we can still have an exceptional summer. But I think it’s unwise to expect a (positive) return. “We’re hearing that growers who aren’t tied into a canola seed purchase are looking at short season, cooler crops such as peas, oats, flax, barley and wheat. Most of the wheat varieties we have now are pretty durable compared to canola. But if we get an early frost on top of a late seeding date, then nobody’s going to be happy,” he says. 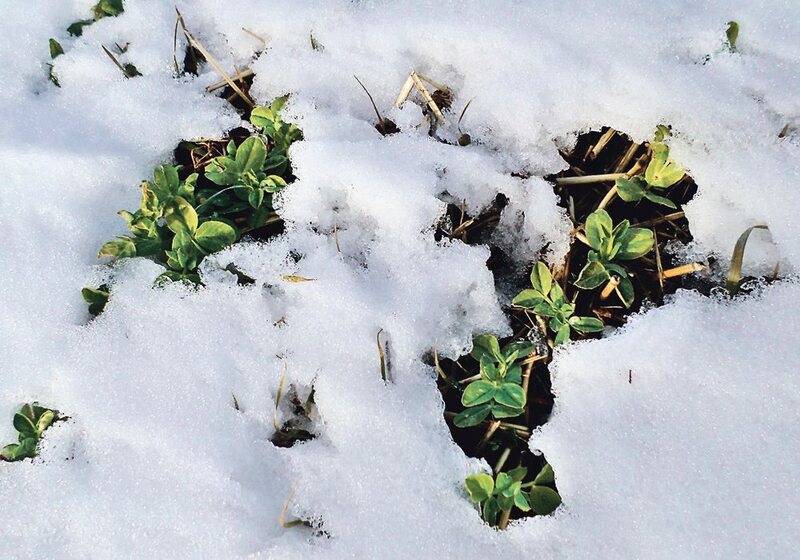 Field agronomists from Greer’s company report that a few farmers are planning to try soybeans, which is surprising because soybeans require a lot of heat units. The 2017 hay harvest fell far short of average in most areas. Greer, who owns a half-section of alfalfa near the 49th parallel, knows this scenario all too well. “That’s where I grew up farming. When I sampled the soil last spring, it looked like the plants might not green up at all, it was that dry. The crop just went backwards through the spring and summer. We had no rain. So yes, I know there’s a demand for feed. Western Ag agrologist Jocelyn Velestuk has been assessing the value of greenfeed on her own farm. “In our area, we have been getting four bales to seven bales per acre of silage. Each bale is about one tonne. Greer says if there’s an upside to a year like this, it’s that farmers can put in some kind of greenfeed or plow-down cover crop. Then they can seed winter wheat or fall rye at the end of summer.